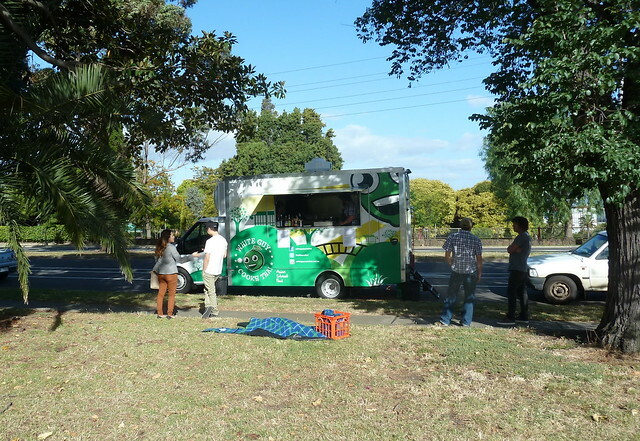 Footscray Food Blog: The West's first food truck - 'White Guy Cooks Thai'! 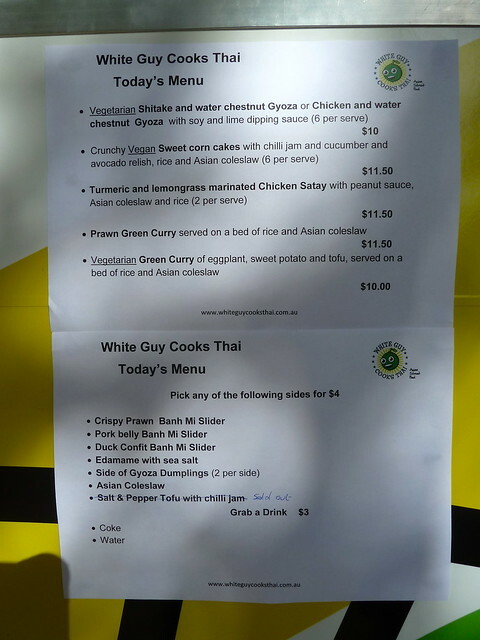 The West's first food truck - 'White Guy Cooks Thai'! Things we love: Pork belly, banh mis and sliders. Things we love more: Pork belly banh mi sliders! 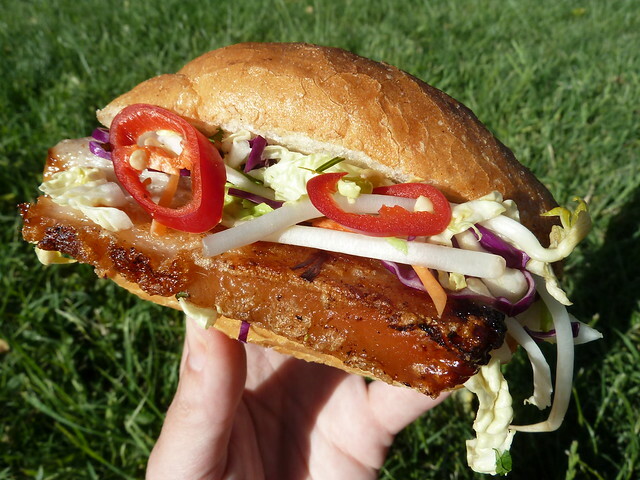 Things we love most: A food truck that sells pork belly banh mi sliders!!! Things that make our head explode: A food truck that sells pork belly banh mi sliders, IN THE WESTERN SUBURBS!!!!!!! Yes, westies, we're not Melbourne food trucks' forsaken faithful anymore. 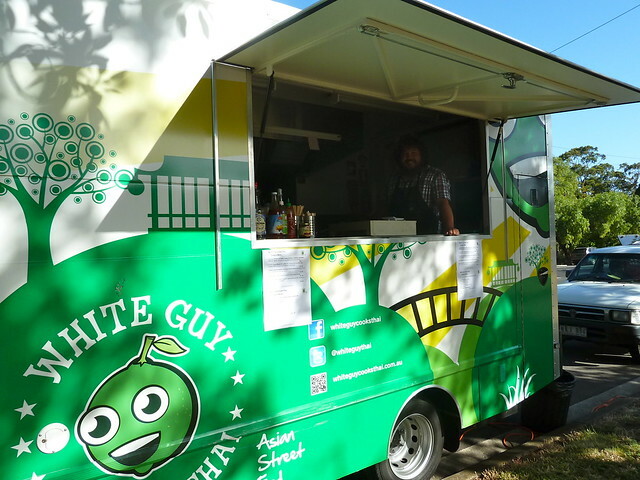 Big thanks to Simon, David and Rachel of brand new food truck "White Guy Cooks Thai" who have chosen to bring their blend of funked-up, fresh Thai to Footscray, Yarraville and surrounds right off the bat. 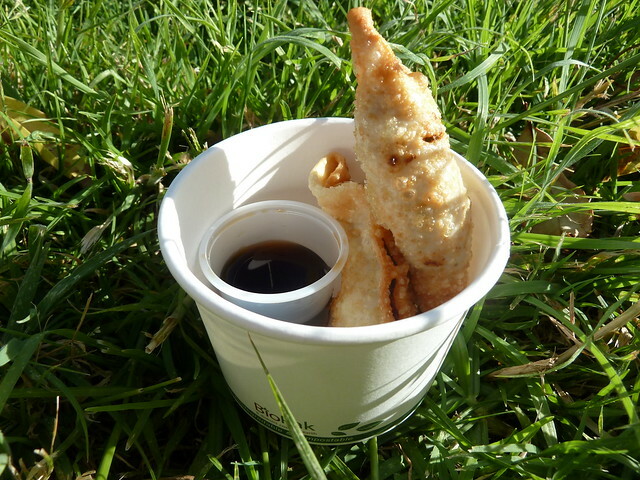 There are mains like curries (that changes daily) or vegan sweet corn cakes, and you can mix and match with sides like these gyoza with soy n' lime dipping sauce. These were crisp, non-greasy, punchy parcels of flavour - one chicken and water chestnut, the other water chestnut and shiitake mushroom. I had brought some magazines, intending to nibble daintily while turning pages. I didn't even open the front cover though until I'd completely devoured this fantastic specimen. The pork belly was thick, juicy, and crisp and soft in all the right places. The juices mingled with creamy mayo and tangy chilli sauce, set off by gorgeous Asian slaw. I would love an even crispier bun though (I know Nhu Lan make a mini bread roll similar to this one, and theirs have that real banh mi crackle and crunch). You can read more about owner Simon and his CV in Meld Magazine here, but suffice to say he knows his tom yum from his yum som. Today's curry was green prawn, while yesterday Kenny really dug White Guy's beef massaman. White Guy will be touring Wednesday to Sunday, so keep track of the truck via their Facebook and Twitter to see where it'll be next. It's a brilliant set up for families - just set up in whatever park's nearby, wander over and the kids can play and run about with no worries about mess. One $4 slider (minus chilli) from the "sides" menu would be perfect for a child. If building a meal for an adult from the sides alone, I'd say get three. So I don't know about you, but summer just got even more exciting! Thank you so much Andy of Krapow for the tip. Ooohh, so happy you made it! I feel good about this, too. Hadn't thought about the kids angle - yes, it's perfect. And from what they told me, there seems no reason for trucks not being in the west - now at least - 'cept maybe they prefer to hang in hipster suburbs like Northcote or Brunswick. Yes, I asked the same thing - "I thought Maribyrnong Council wouldn't give out food truck permits?" - and WGCT said they were totally cool with it. I guess with the trucks that are already doing great business in the north, why would they just turn their back on an already significant and loyal customer base to push into "uncharted territory" out west... Still, one would hope that now some food truck businesses are getting a second physical truck, they might consider putting the second to work out here. But that's not to take away from White Guy Cooks Thai. It's DELICIOUS! Can't wait to chase down the truck and sample some of the menu. Appears to be a nice selection of dishes on offer at very reasonable prices. G'day Nat - have been so enjoying your Thai food snaps! Holy moly! I reckon you will love this one. They are nice people too. I love your blog and love even more that there's a food truck set up in the west! Something's left a pretty bad taste in my mouth in this blog entry though - and that's the red headed step child comment. I'm sure you didn't mean to cause offence but I'm not sure how I would explain that comment to any child. It is offensive - to illustrate this swap 'red headed' for any other ethnicity and I'm sure it would not of been published. Can I suggested you edit it out. Food for thought. Hi anon, gosh, I didn't mean to cause offence. The phrase is something that I have heard my North American/Irish husband say on occasion. I know it was new to me when I heard it but maybe it's not only new to me but totally unheard of to Australians and therefore liable to be taken very literally, rather than "glossed over" like other common sayings might be without really thinking of what they mean. Like, I don't know, shooting fish in a barrel. I mean, who would do that? You know what I mean? Anyway, I have changed it to what I was trying to get at. I guess if I'm poking fun at any ethnicity, as a pale, pasty, green-eyed redhead (dyed, but I am probably only one genome away from red hair), it's my own! Were these the guys who were at the Errol St stall with the khanom jin noodles? Gonna check it out - hopefully they're near Yarraville tonight; I can go before finally going to see Skyfall! No, that's Andy who writes Krapow :-) These guys are different but they have Andy's stamp of approval! They're not travelling on Mon or Tues though! Only Wed-Sun. Do they play Greensleeves on their PA system? No :-) You know, my sister send me this great thread on Reddit of "lies I have told my children". One person said they told their kids that the ice cream truck only plays the song to say they have RUN OUT of ice cream. I hope the truck is allowed near the Yarraville Village and appears often when the popup park is installed. How awesome would that be on a balmy night? Absolutely beyond awesome! They would have to contend with the other traders there though - I think that's why food trucks got kicked out of the Docklands, because people flocked to them and didn't patronise any of the other eateries! I've suggested Shorten Reserve in #wefo. In fact, anywhere next to a park would be absolutely golden. Getting to the bottom of this is on my to-do list... Can't we have a compromise, with generators off by, say, 9pm? I did see White Guy said they were in Seddon on Twitter just recently. Has the decision been revised? Hi all! I talked to the WGCT folk when we had Thai in Seddon about a week ago. They seemed to think the ban was prompted by a mix of residential and business concerns. But the decision is under review. Lauren, I doubt any food truck generators run much past 9pm anyway. When we talked to them, they were parked in Gamon St, which would seem to be more suitable than the side street. If I lived there, I suspect I wouldn't be too impressed, either. Really? You wouldn't like it? I would love it! Maybe not more than once per fortnight, but I'd love a food truck in my street. Interesting re business concerns. I guess businesses can't object to a competitor setting up in a shop down the road, but they can object to a truck! Not really an even playing field.